Using the staircase can become difficult as you become older. Many elderly people struggle to live independently, because they are unable to walk up and down the stairs on their own. This can force someone to leave his or her home and have to live in a nursing home. Instead of buying a new home or entering a nursing home, you can invest in an elderly stair lift. An elderly stair lift will allow you to move up and down the stairs with ease. 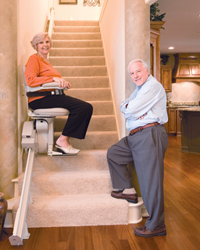 Stair lifts are affordable, energy efficient, and easy to use. They work by using chair that travels across a track to carry you between floors in your home. No construction is needed to install one of our elderly stair lifts. 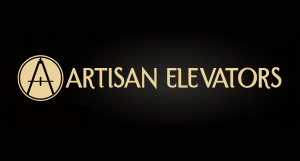 It is a much less expensive alternative to a home elevator, buying a new single level home, or paying to live in a nursing home. The stair lift runs off the power from a regular wall outlet, keeping the cost of operation low. At Indy Stair Lifts, our products use a rechargeable battery that powers the chair. Having the rechargeable battery allows you to use the stair lift anytime, even during a power outage. The battery charges whenever it is parked and a fully charged battery can provide you with up to 40 trips. At Indy Stair Lifts, we have both straight and curved track elderly stair lifts. While many staircases go straight up to the next floor, some take a turn first. If your staircase takes a turn before reaching the next floor, we can manufacture a custom track that fits specifically to your home. Our stair lifts come with a foot rest, arm rests, seat belt, and upholstered chair, providing you with a safe and comfortable ride. Whenever the stair lift is not in use you can fold it up so it does not hinder the stairway. Extend your life at home by maintaining your independence and mobility with one of our elderly stair lifts. Having the freedom to reach any area of your home will be a priceless ability for any elderly person.